Jokes for kids are often an endless source of entertainment, and we have a great selection of jokes for your kids to use! Jokes for kids can be used at school, during parties, driving in the car, and even sitting around the dinner table with family. 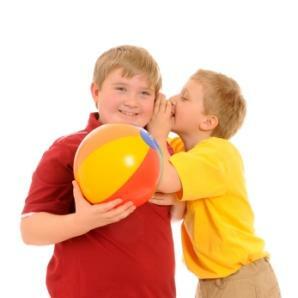 Once kids get started telling jokes, they often can't stop as they try to top each other with the silliest joke. Your kids may want to start their own joke club with their friends. You and your kids may find yourselves with an uncontrollable case of the giggles. It's fun to laugh, and our jokes for kids will help you and your family get started! Why did the banana go to the doctors?-It wasn't peeling well! There was a blonde on one side of the river and a brunette on the other side of the river. The brunette said, "How do I get to the other side of the river? "-The blonde said, "You are on the other side of the river"
Why did the policeman spend a lot of time in his bed?-He was an undercover cop. How much does it cost a pirate to get his ear pierced?-A buccaneer! What do you call a snail on a ship?-A snailer! Why did the turtle cross the street?-To get to the Shell station! Why didn't the elephant want to play cards in the jungle?-There were too many cheetahs! What do you get when you cross a brontosaurus with a lime?-A dino-sour! What do pigs put on when they get burned?-Oinkment! Why are monkeys so noisy? -They were raised in a zoo! Why couldn't the skeleton play a musical instrument?-He had no organs! Were does the Easter Bunny go for brunch?-IHOP! Knock, knock. Who's there? Police. Police who?-Police stop telling these awful knock, knock jokes! Knock, knock. Who's there? Leaf. Leaf who?-Leaf me alone! Knock, knock. Who's there? Shelby. Shelby who?-Shelby coming around the mountain when she comes. Knock, knock. Who's there? Dishes. Dishes who?-Dishes the police! Open up! Knock, knock. Who's there? Panther. Panther who?-Panther no panth, I'm goin' thwimmin'! Knock, knock. Who's there? Canoe. Canoe who?-Canoe come out and play? Knock, knock. Who's there? Orange. Orange who?-Orange you glad I didn't say banana? What three letters can you eat?-P,B,AND J ! What has four legs but can't walk?-A chair! What is a tornado's favorite game?-Twister! What is black,white and red all over?-A newspaper. Why did the fish go to the library? -To find some bookworms! Why should you never trust whales with your secrets? ?-Because they're all blubber-mouths! What is a carpenter's favorite fish?-A hammerhead shark! Why are Grandma's teeth like stars?-Because they come out every night! Why did they fire the cross-eyed school teacher?-He couldn't control his pupils! Why did the baserunner go to jail?-He stole two bases! What has eighteen legs and catches flies? -A baseball team! Why didn't the first baseman get to dance with Cinderella?-He missed the ball! If you have a favorite joke you'd like to see added to our list, we'd love to hear from you! Please post the joke and the punch line in the comments section of this article. Don't forget that these jokes are for kids, so keep them clean!